Approximately one-third of elders aged 65 and older suffer from falls each year.1 In fact, falls are the third leading cause of unintentional deaths for elders; each year at least 2.5 million of them are sent to the emergency department for fall injuries.2,3 Per 2013 statistics, the medical costs for fall injuries amount to $34 billion annually, of which two-thirds results from hospital costs.1 Causes of elders' loss of balance can vary but are commonly associated with orthostatic or postural hypotension, which manifests with dizziness or fainting upon standing. Orthostatic hypotension is associated with falls, even without dizziness with standing.4 Loss of balance and falls can be attributed to problems within the vestibular system, which involves fluids and canals that control a person's orientation and sense of motion. In addition, elders taking prescription medication are also at a higher risk of falls due to possible induced side effects. There are techniques that individuals at risk of falls can use to prevent or mitigate the loss of balance in specific situations. The objective is to design a device that will reduce the number of fall injuries to the extent possible and provide older adults with a tool that will alert them of any potential incoming falls. The study described here seeks to provide a method to quantitatively assess competence at balance and potential resolution of the problem. A group of professors, Deanna Gray-Miceli, PhD, GNP-BC, FAANP, FAAN, from the Rutgers School of Nursing-Newark; William Craelius, PhD, a professor of bioengineering; and Nicki Newby, PhD, president of Nian-Crae, Inc, who holds an adjunct appointment in the school of bioengineering at Rutgers University, and three Rutgers University undergraduate students, Christopher Sheng, Victoria Ren, and Elysha Benbury, collaborated in designing a device that will be able to detect potential balance issues through a smartphone application. Sheng and Ren are studying to become biomedical engineers, while Benbury aspires to become a physical therapist. All three students have been selected to participate in this research through special funds made available to them through the Aresty Research Center. Shortly after the initial application essay and submission of required materials, the students met with their professors and were introduced to the project objectives and deliverables, carried over two academic semesters. For Benbury, the proposed research presented an opportunity to participate in clinical research involving older patients in rehabilitation. For Sheng and Ren, the proposed research offered a chance to plan and develop a device that can potentially be used to help patients live better lives, recognizing that this is the first step in a long journey of establishing proof of concept. For this type of research, Gray-Miceli sought to collaborate with bioengineering faculty and students whose background and experience with medical devices will facilitate development of smartphone technology. Engineering students are exposed to a computer program called MATLAB, a programming language that utilizes matrices to perform mathematical operations useful in developing appropriate smartphone technology. Furthermore, engineering students are given the opportunity to participate in developing a smartphone device, an experience hardly available in lectures. Meanwhile, Craelius mentors students on their approach to measuring balance for elders using MATLAB. He encourages students to use creative thinking to develop their own methods to parameterize balance. Newby has also contributed to the project by building a smartphone application that measures parameters that closely monitor movement, including an individual's acceleration and degrees of motion. The research ultimately breaks down into three parts: the initial planning, the sampling design, and device development. The team worked in search of a tool that could assess balance during elders' daily living activities, such as walking, sitting down, and standing up. They programmed an app that used sensors in a strapped-on smartphone to measure body movements such as sway, jerkiness, or acceleration, any of which can trigger a loss of balance. The app detects the rate of changes in movements using a gyroscope, which is a part of the smartphone technology. Researchers found that isolating movement patterns immediately before a change in balance could help predict when a person is about to fall. Testing the app involved strapping smartphones to both the sternums and the lower backs of individuals ranging in age from 76 to 94. Researchers monitored their blood pressure changes, which can be associated with a loss of balance and falls, before and after subjects stood up and sat down several times. The sway movements and acceleration of motion captured by the app, coupled with blood pressure readings, contribute to a baseline database to help researchers construct a predictive model of falling. In the initial planning phase, the team identified the parameters needed to measure balance. Although there are many variables and factors associated with balance, the decision was made to obtain baseline data that differentiates adults aged 65 and older with various health conditions, such as orthostatic hypotension, from healthy young adults in their 20s, by measuring both age groups' body motion (acceleration and angular displacement of the upper torso) from a sit-to-stand position. The data were gathered using two smartphones with an application called SensoryLog created by Newby, and generating graphical data as illustrated in Figure 1. Plans were also needed for designing the experiment. Students decided to gather one representative sample of older adults and a convenience sample of young adults for comparison. Young adults were asked around the Rutgers campus whether they were interested in participating in an experiment. With consent, students were asked to sit in a chair with two smartphones attached to them to monitor and measure their body motion. Afterward, students were directed to rise from their chairs at any comfortable speed they desired and end the experiment. 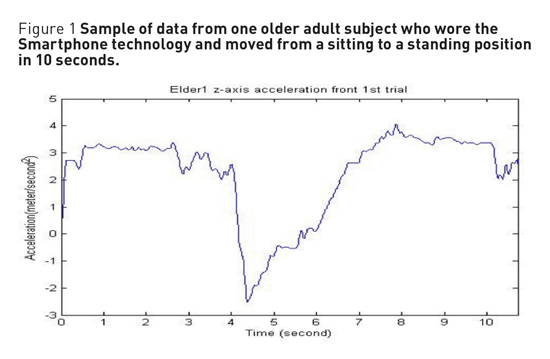 The data from the smartphones were transferred to a personal computer where the data can be plotted by MATLAB and Microsoft Excel to provide quantitative data about body motion from a sit-to-stand movement as seen in Figure 1. The data obtained on smartphones were then transferred to a personal computer and were categorized separately from the young adults' data. The team is currently working to analyze the preliminary data, which show promising differences between the two samples. 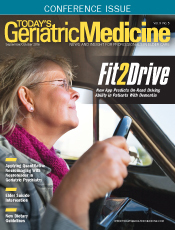 Under the direction of Gray-Micelli and Craelius, to determine whether patterns in motion can predict loss of balance, future research studies are planned with larger samples of elders with various comorbidities who have fallen. At this time, the field is evolving. Future research will need to consider multilevel factors and correlates related to an individual's symptom experience, motion, environment, and other salient factors. The team envisions developing technology for older adults that signals early changes in motion likely to lead to a fall. There are many benefits from participation in clinical research with at-risk populations of older adults who experience falls. These benefits extend to the older adults, as well as to the students and the faculty. Tables 1–3 provide detailed thoughts about potential benefits realized from our research. For older adults, potential benefits include the opportunity to establish a relationship with researchers and to participate in shaping scientific advancements and technology. Older adults also can also develop a positive relationship with students and researchers for the improvement of clinical problems. For students, the benefits of working within a team from the predesign to the design phase and analysis includes enhancement of critical thinking skills, the ability to share ideas collectively and contribute toward "group think," and reinforcement of the scientific research process. Faculty too benefit, as knowledge is translated to the next generation of young scientists. There are many lessons learned from our pilot research and team collaboration. Perhaps the most interesting aspect of the project has been the immense amount of time required to complete our research. Almost eight months were spent on planning and recruiting subjects for this experimental pilot study. Performing the experimental protocol itself required a strict schedule for students and faculty. Monthly and oftentimes weekly team meetings allowed the team to stay on schedule. Prior to the actual start of the study, there was a prephase of learning in the area of the ethical conduct of research and skills acquisition in Java programming, and the use of MATLAB as well as the sensory analog data. However, the knowledge obtained from designing the experiment along with our faculty mentors as well as reaching out to older adults in a clinical setting offered a valuable experience that will likely shape and influence future endeavors. — Christopher Sheng, BS, a bioengineering student, is a 2016 graduate of Rutgers University in New Brunswick, New Jersey. — Deanna Gray-Miceli, PhD, GNP-BC, FGSA, FAANP, FAAN, is an assistant professor at Rutgers University School of Nursing and Institute for Health, Health Care Policy and Aging Research in New Brunswick, New Jersey. — William Craelius, PhD, is a professor of bioengineering at Rutgers University. 2. Injury prevention and control: data and statistics (WISQARS). Centers for Disease Control and Prevention website. https://www.cdc.gov/injury/wisqars/. Updated May 4, 2016. 3. National Center for Injury Prevention and Control, Centers for Disease Control and Prevention. Ten leading causes of unintentional injury deaths, United States, 2010. http://www.cdc.gov/injury/wisqars/pdf/10lcid_all_deaths_by_age_group_2010-a.pdf. Accessed December 27, 2013. 4. Gray-Miceli D, Ratcliffe SJ, Liu S, Watland D, Johnson J. Orthostatic hypotension in elderly nursing home residents who fall: are they dizzy? Clin Nurs Res. 2012;21(1):64-78. 5. Tinetti ME, Richman D, Powell L. Falls efficacy as a measure of fear of falling. J Gerontol. 1990;45(6):P239-P243. We acknowledge all of the older adult residents who participated in this important research project. We extend special thanks to fellow students Victoria Ren and Elysha Bembury for their assistance in all aspects of this project. Thanks to Nicki Newby, PhD, whose guidance was tremendously helpful as we navigated new waters learning about sensory log applications. Funding was made possible by the Aresty Research Center at Rutgers University, whose support allowed us to participate in this research project during the 2015–2016 academic semesters.